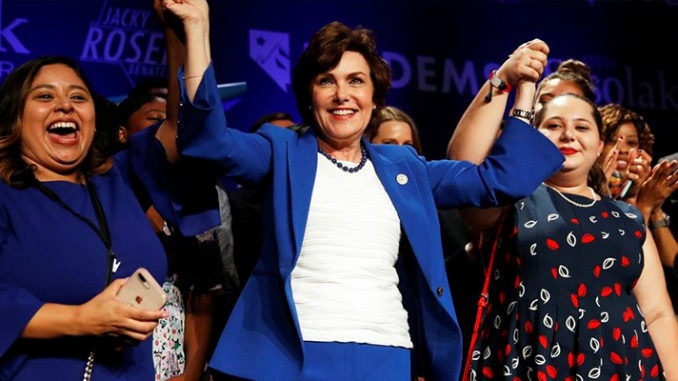 Rep. Jacky Rosen, D-Nev., center, celebrates at a Democratic election night party after winning a Senate seat Wednesday, Nov. 7, 2018, in Las Vegas. A female political movement driven by backlash to President Donald Trump kicked off 2018 by hosting a women's march in Nevada and 11 months later, that activism helped women win key races across the state, including ousting an incumbent U.S. Senator, electing a female-majority federal delegation and a female-majority state Assembly.